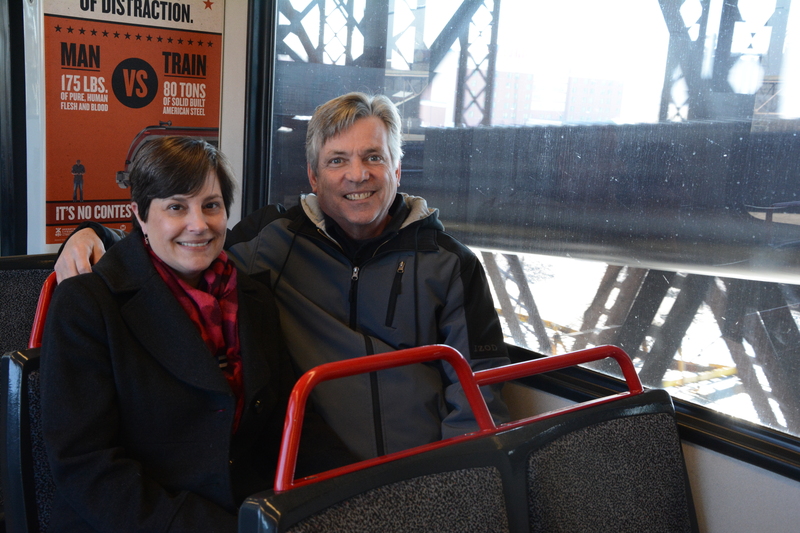 In celebration of Valentine’s Day next week, we’re sharing the stories of couples who met on MetroBus or MetroLink. Here is Amy and Jack’s story. Amy works at the Bi-State Development Agency, which operates the Metro transit system for the region. The beginning of Amy and Jack’s relationship was a lot like our MetroLink trains. Their romance always moved forward, but at different speeds. 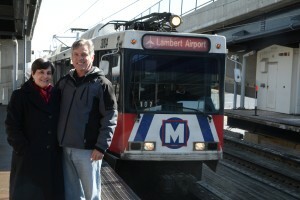 Amy was a regular MetroLink rider long before she started working for the Bi-State Development Agency. Jack started taking MetroLink on a regular basis about four and a half years ago, after he had given his youngest son his car to get to work. It turned out to be perfect timing, as Jack’s employer had started offering transit benefits. 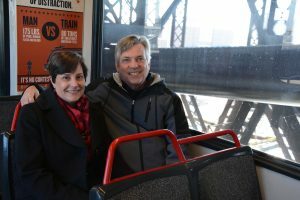 It was only a matter of time before destiny intervened, and their commutes finally crossed paths in 2009 while they were both waiting for a train at the Brentwood I-64 MetroLink Station. There was never a shortage of conversation between them at the MetroLink platform or on the train, Jack said. They’d talk about pretty much anything, from family to recent vacations. These conversations eventually led to their first official date at Mai Lee, a Vietnamese and Chinese restaurant that happens to be just steps away from the Brentwood I-64 Station. However, it wasn’t everyday that they’d ride the train together. Early in their relationship, Amy would often need to travel or spend time taking care of her family, and sometimes they would go weeks without seeing each other. Still, they were always able to reconnect and pick up right where they left off. It was love, and Amy and Jack have been married since September 2013.